Are people born leaders, or do you become one with hard work, by experience, or chance? What do you believe is the most important quality an entrepreneur must possess or develop to be a powerful leader? Our panel of entrepreneurs stepped up to the challenge to share their thoughts on the most important qualities a solid leader should possess or develop in business. Have a read through the list, vote for or add your favorites in the comments area below, and then ask yourself, what are you doing each day to become a strong leader in your niche? Enjoy! I think one of the best qualities of a leader is someone who follows their own path, a person who thinks outside the box and is innovative. Leaders are individuals that others want to follow. They lead by actions not words. Leaders have vision and are able to articulate it so others can see it for themselves and execute it. Leaders are optimistic and keep those around them excited about the possibilities. Leaders work tirelessly with determination and provide meaning for those who join them. In my experience, leaders are often the first to wake and last asleep and ready to do whatever is necessary during the hours in between. Leaders listen well but know how to make decisions. They believe in themselves. They walk the talk. A strong leader needs to be able to make decisions, sometimes quickly, without fear or second-guessing. Her decisions need to be well informed, but should not be postponed because of a lack of information about trivial details. Most importantly, a strong leader takes full responsibility for her decisions – particularly when they turn out to be the wrong decisions. She learns just as much, if not more, from these choices, and learns to embrace them. One of the most important skills that a leader should possess is authenticity. Are you being true to yourself and your customers? Are you showing your customers who you are? Are you giving your customers the best of you? These are all questions to ask when striving for excellence as a leader. Be true to yourself and to your supporters. Give them the best of you. 1. Willing and able to do what it is that they ask others to do. Not necessarily tasks, but, commitments. 2. Willing to make mistakes publicly – that there is less concern over ego and more on experimenting to make something be better. 3. Consistent in word and deed, because that is the only way I can trust that person. 4. Going to listen with their heart – to really HEAR the intent and not just to the words being spoken. 5. Standing for a higher purpose – if our involvement is only about money, I have other people I can follow… and will. When I watch gymnasts perform on the balance beam, and fly on the parallel bars and do amazing floor routines, I am in awe at their ability, flexibility, and strength. As an entrepreneur, you often have to perform as a gymnast. Balancing the needs of your self, your business, your employees, and your customers. You need to be able to jump, flip, roll and use strength every day. And you have to be flexible. Great leaders need to be able to “stand above the fray” and stay alert to both the opportunities to enhance – and the threats that could diminish – their organization’s growth and well-being. A good leader must drink the kool-aid, meaning that they must BELIEVE whole-heartedly in the vision and the purpose of the mission they are leading. Their belief in the mission will do more than inspire and help others to achieve greater things than they might have accomplished on their own, it will help them all to stay optimistic when the going gets tough. Belief in the mission is a pledge of personal commitment and the leader will do whatever it takes to accomplish the goal. That means the leader will remain loyal to the people they are leading, recognizing the strengths with individual team members and letting them shine whenever possible. They will be flexible in their tactics and willing to let go of their ego for the greater good. They will lead, but only if they BELIEVE! Being persistent means that you need to keep site of your worthy goals and know that they can be reached in many different ways. Many times I think something ought to take less time than it does and when that happens I can feel disheartened. Instead of entertaining those discouraging thoughts, I can persist. This has made all the difference in my ability to create the business that I’ve dreamed of. I read somewhere, your persistence is the measure of the amount of faith you have in yourself. Leaders have only their words and their actions with which to influence others to follow them. If their words fail to inspire or if they do not capture the potential in the actions, leaders will not be able to lead well, perhaps not be able to lead at all. As guru John Maxwell puts it, “Leadership is influence. That’s it. Nothing more. Nothing less.” And if your words cannot influence or inspire, you really cannot lead. When I was working successfully within Corporate America, I remember having a significant conversation with my manager about my job performance. He was thrilled with my achievements, my growth and my ability to inspire others amongst our team. While I should have been thrilled to hear all of this praise, I couldn’t help but feel neutral. I told him how although I knew I was good at my job, that I just wasn’t passionate about it. I shared with him my intention to tap into my inner-self to really connect with what I wanted to do with my life. A few months later I separated from the corporation and ventured out on my own to launch my company. Passion isn’t learned, it’s felt. It’s what makes me proud, and it’s something I try to help my clients discover for themselves each and every day. Aside from typical leadership qualities for success, such as effective communication, time management, vision, accountability and more, perhaps the most important is ethics. This is the foundation for respect and trust, essential elements for building lasting relationships with clients, peers, subordinates and all those with whom you interact. If you sense the sincerity of the leader, understand his or her vision and plan, and trust that their word is honest and true, then you are inspired to support and deliver for that leader. I discuss this important leadership characteristic in my book. 13. Passion, Is It A Sin? There are many facets of being a good leader: Visionary, Confident, Inspiring, Charisma, but to me the single most important facet is passion. I believe if you don’t have passion, you can’t be an effective leader. People do not buy your vision unless they “feel” your vision. Passion is the ingredient that excites people, makes them buy into your vision, and believe in your vision. Passion instills confidence they are part of a great cause and organization. Leaders who are passionate also are willing to step out of their comfort zone and try something new and different. Leaders lead by inspiring others to follow them. Passion is what inspires others to follow you. You are only a leader if people follow you. Are you passionate about what you do? If not, why not? Be a leader, get passion. Thanks to Lynndel Edgington of Eagle Research Associates, Inc.
Not all leaders have great vision; but those that do have great responsibility because they make a great difference. 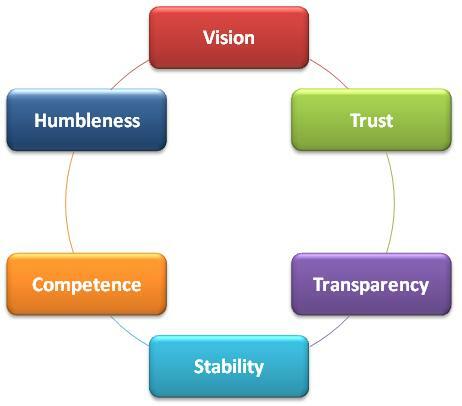 A great leader has vision, humility, and certainty. However, leaders of any kind must aspire to greatness, even though they may not attain it; because aspiring enhances desire for excellence, elegance, and precision. Real leaders lead by example: they take the hard road when not in flight…– And the visionary leader: by seeing in the future and seeing in the dark: can assure his followers of safety and danger under fire and over ice. The greatest leaders of all are of genius, refinement, and beauty. May they thrive forever! A natural leader becomes a true leader by building great people around them. The ability to develop a strong team that supports the vision, values and virtue of your company is critical to your sustained success. Effective interpersonal skill is a core leadership development trait. Leaders who are good communicators, active listeners and broad thinkers can build a team that will give them a decisive edge in their industry. Team-builders who are able to coach, encourage and empower their management and work groups to create stronger connections, solve problems cooperatively and collaborate on projects have the requisite qualities for exceptional leadership. Leaders must be versatile and have the ability to juggle many tasks and quickly move from one business aspect to another. In the beginning, most entrepreneurs wear a lot of hats, from marketing, editing, PR, web design, sales and so much more. Jumping from one job to another as things pop up requires skill and agility as well as the ability to juggle everything at once. A great leader must be a great listener. Leaders must be able to listen to all ideas and not judge immediately, but rather take the time to think about what others are doing and saying. Leaders can not afford to force their own ideas on their employees/staff or they will snuff out creativity. To lead effectively in your business, you need to be able to stop talking about yourself and start listening to what your people actually need and what. Great leaders and business owners alike know how to serve their target market. They pay attention and act accordingly. Listen and your people will tell you what they need! Leaders have belief. When ones at the top keep looking for ways to make things happen the one underneath will see the actions and be inspired. When all you have is belief it can take you along way. When in doubt you better belief it. Having a strong sense of vision is one of the most defining traits of a great leader. Being able to look towards the future and to make that vision a reality is what separates a legendary leader from a common one. A futurist like Steve Jobs was able to properly look down the time-line and produce products that are so far advanced that consumers didn’t even know they wanted them. This forward thinking mentality, coupled with the ability to make your ideas real, is a very powerful ability as a leader. Communication is critical to the success of every leader. Whether you’re seeking to gain new customers, motivate employees, or present to investors you must effectively connect with your audience. There are numerous variables that must be considered: tone, non-verbal messaging, background, credibility, education and interests, just to name a few. Being a life-long learner on this topic is important, especially as cultures and mediums change. But, if you’re consistently seeking to improve your communication, and you prepare and practice your delivery, you’ll find it will be an investment that will pay great dividends for every facet of your business. As an entrepreneur I find follow-through to be one of the most important qualities to have as a leader. Following-up with someone about a question involving time-off, a deal that needs to be made, or even advice is vital to your reputation as a leader. Forgetting about those little details is a sure-fire way to alienate yourself. Without proper communication and follow-through you will prove to individuals that you care very little about what they think. Showing your peers in business that you listen to them goes an incredibly long way and paves the road to being a successful leader. 24. Stick To Your Guns! Leadership requires something I like to call “stick-to-itiveness,” a combination of determination and intuition. You have to know what you stand for, and stick with it. Maybe you have a business or an idea that you’re passionate about, and that you believe in, but other people just don’t get it (yet). If you let that negativity drag you down, you’ll never reach your potential as a leader. For my business, I know why I do what I do, and what gets me up every morning and makes me excited about the future. Over time I’ve learned to listen to that intuition, and not be swayed by what other people think I should be doing. Being an effective dealmaker is key to being a successful leader. Well-honed negotiation tactics and closing the deal can make or break your business. Properly connecting with people and seeking out resources that can both benefit your business should be an inherent trait as a leader. Actively seeking out ventures that will turn a profit is incredibly important. Putting good deals together is a great leadership quality because you lead by example. Thanks so much again to all our wonderful contributors for providing your thoughts on the most important qualities of a leader in business! We hope to hear from you again. And to all our readers, if you have an innovative idea to share, we hope you will leave it in the comments below. This entry was written by Dr. Shannon Reece, posted on February 13, 2012 at 6:00 am, filed under Question of the Week and tagged entrepreneurship, how to lead in business, leadership, leadership qualities, small business tips. Bookmark the permalink. Follow any comments here with the RSS feed for this post. Post a comment or leave a trackback: Trackback URL.